On your three-weeks, long trek to Damodar Kunda, explore the Upper Mustang Region and learn a lot about Tibetan Buddhism. Lying at the rain Shadow of Annapurna region, Damodar Kunda holds strong value among Hindus. It lies at an altitude of 4890. Every year in the full moon of August, hundreds of pilgrims go to Damodar Kunda to pay homage to Lord Shiva. On your way to Damodar Kunda, you will get breathtaking views of mountains like Dhaulagiri, Nilgiri, Annapurna, and more. As you walk through the remote upper Mustang region, you will get a chance to explore the unique culture, tradition, and lifestyle of people of Upper Mustang. 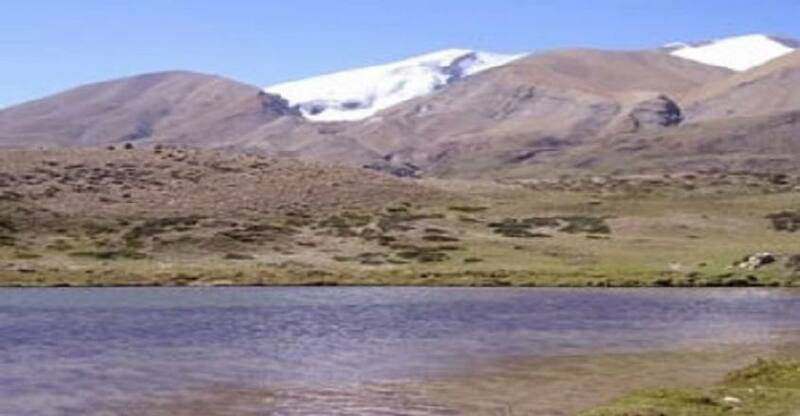 Lo-Manthang - the ancient walled city is another attraction of this trek. On the first day, you will arrive at Kathmandu and spend your time in your hotel room. After spending the next entire day sightseeing Kathmandu, you will travel to Pokhara on the third day. Another day, you will take a morning flight to Jomsom. Then, you will begin your trek. After walking for about five days, you will reach the walled city of Lo-Manthang. You will spend a day exploring the town and the surrounding. Then, you will walk through the barren landscape and many high passes for three days to finally reach the Damodar Kunda. After spending a day exploring Damodar Kunda and the surrounding, you will walk for six days to arrive at the lively town of Jomsom. The next day, you will fly to Pokhara early in the morning. You will spend that day sightseeing Pokhara. The next day, you will travel to Kathmandu by bus and fly back to your country on another day. Remember, you can shorten or extend the trek as per your need. Day 01: Arrival In Kathmandu Nepal 1300m. Day 02: Sightseeing & Trip Preparation In Kathmandu. Day 03: Kathmandu To Pokhara Travel Hours: 5-6 hours. Day 04: Fly From Pokhara To Jomsom Then Trek To Kagbeni 2810m Trek Hours: 4 hours. Day 05: Kagbeni To Chele 3060m Trek Hours: 6 hours. Day 06: Chele To Syanboche 3475m Trek Hours: 7 hours. Day 07: Syanboche To Ghami 3520m Trek Hours: 6 hours. Day 08: Ghami To Tsarang 3560m Trek Hours: 4-5 hours. Day 09: Tsarang to Lo-Manthang 3800 m. Trek Hours: 4-5 hours. Day 10: Explore Lo-Manthang 3800 m.
Day 11: Lo-Manthang To Yara 3900 m Trek Hours: 6 hours. Day 12: Yara To Ghuma Tanti 4800 m. Trek Hours: 7 hours. Day 13: Ghuma Thanti To Damodar Kunda 4800 m Trek Hours: 8-9 hours. Day 14: Explore Damodar Kunda 4890 m.
Day 15: Damodar Kunda To Ghuma Thanti 4800 m.
Day 16: Ghuma Thanti To Yara 3900 m. Trek Hours: 6-7 hours. Day 17: Yara to Tangye 3240m Trek Hours: 8 hours. Day 18: Tangye to Tetang 3040m Trek Hours: 10 hours. Day 19: Tetang to Muktinath 3700m Trek Hours: 6 hours. Day 20: Muktinath to Jomsom 2720m Trek Hours: 5 hours. Day 21: Fly from Jomsom to Pokhara 820m. Day 22: Travel From Pokhara To Kathmandu. Welcome to Nepal. One of our Halesi Treks staff will pick you up from Tribhuvan International Airport entrance and transfer you to your hotel room. You will then spend your time resting in your hotel room, or you can come and visit our office. You want to spend your time exploring Kathmandu, let us know. Our city guide will take you to some attractions in Kathmandu. Today, you will spend your day exploring Kathmandu. Kathmandu is home to several world heritage sites. You will visit Pashupatinath, Swayambhunath, Boudhanath, and Kathmandu Durbar Square. In the evening, we will transfer you to your hotel room with enough time for you to pack for the Damodar Kunda Trek. overnight at hotel. Travel to Kathmandu by a private car or bus that takes about 5-6 hours. You will have half a day to sightsee Pokhara. Pokhara is touristic heaven of Nepal. It has attractions like Phewa Lake, Begnas Lake, and many adventurous sports like paragliding, zip flyer, mountain biking, and more. overnight at hotel. Early in the morning, you will fly to Jomsom from Pokhara. The flight is full of scenic view of Himalayas and hills of Nepal. You will meet your support and our staffs in Jomsom. After your breakfast, you will begin hiking towards Kagbeni. For a long part of the hike, you will walk alongside Kali Gandaki river and have the breathtaking views of Dhaulagiri, Nilgiri, and other mountains of Himalayas. Kagbeni is the gateway to upper Mustang. Overnight stay in Tent camp. After morning breakfast, you will show your restricted area permit in a checkpost. 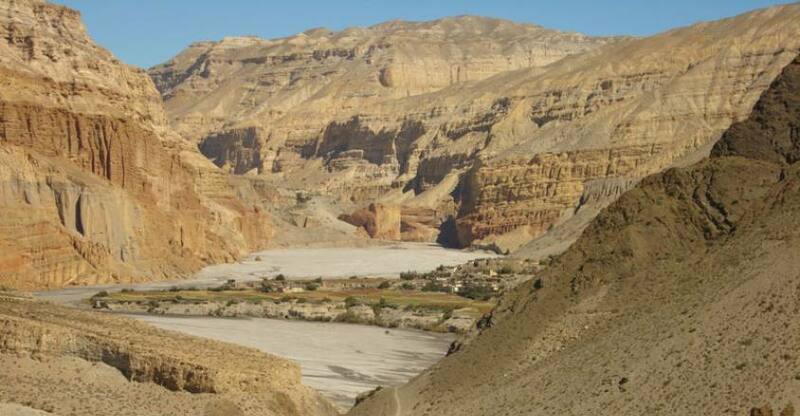 You enter the restricted Upper Mustang Region from kagbeni. At first, the route goes alongside Kali Gandaki River with occasional up and down climbs. After walking for a long time, you cross a small stream and climb uphill to reach Tangbe village. You will have your lunch there and continue your upward climb to reach Chhuksang village. From there, you will climb down to the bank of the Kali Gandaki river and move alongside it. After walking for an hour, you will cross Kali Gandaki by a metal bridge. Then, you have a steep climb to do that takes you to terraced fields of Chele. Walk for a while to finally reach Chele - the night stop of your trek. overnight at tent camp. Leave the village early as you have to a long walk today. At first, you will have to climb up to a plateau through a pebble road. Keep ascending the slope to reach an area with huge canyons. Then, you will walk through a trail carved out on the wall of the cliff. After ascending for a while, you will have a little descent to do reach the village of Samar. You will have your lunch in Samar and continue your walk with a sharp downhill climb to a stream. Then after ascending for a while, you will have another descent to do to reach another stream. After crossing the stream, you will again ascend to a plateau. From there, you will continue your journey and reach Ranchung cave. The huge stalactites in the cave resemble chortens. There is a belief that Rinpoche - the Buddhist saint meditated here in the 8th century. After visiting Ranchung cave, you will walk past grassland to reach Syanboche. Overnight stay in a tent camp in Syanboche. After your morning breakfast, you will ascend to a small pass that has a color-painted small chorten. From there, you can see the huge Ghiling valley spreading out wide. You will then descend towards Ghiling. Along the way, you will have to cross a small stream, walk through stone walls, and farm fields. There are two monasteries and big chortens in Ghami. The village is spread and looks very beautiful. overnight at a Tent camp. After walking across the widely spread settlement of Ghami, you will have a gentle uphill climb to do to reach a point where a trail from another village joins. From there, you will have a long uphill climb to do to reach Nyi-La pass. Cross the pass and enter into the Lo region of Mustang. Then, walk down through a gentle slope with a zigzag walk on the bottom of the slope. As you descend to the bottom, you will reach Ghami village where you will have your lunch. Then, you will pass through Ghami village and cross a river by a suspension bridge. Walk across a long mani wall and look at the strange formations of cliffs before reaching a rocky ravine. Then, you will have a steep ascent to do to reach Tsarang-La Pass. You can get the majestic view of Annapurna from there. From Tsarang-La Pass, descend through a long and gentle slope to finally make your way to Tsarang. And, that’s the end point of your 5 hours long hike. Overnight stay in a tent camp. In the morning, visit an old palace and a Buddhist monastery in Tsarang. This palace and the monastery has a significant value in among the locals of Mustang Region. It is believed that Tibetan Buddhism thrived in Upper Mustang from this monastery. After visiting these ancient places, you will descend to Tsarang River and walk upstream for a while. Then, you will cross the river through a suspension bridge and ascend to a rocky ravine. Then, you enter the valley of Lo-Manthang. The road widens as the valley widens. The desert-like surrounding gives you a different feeling. After walking for a while, you will reach Lo-La. From there, you can get a view of Lo-Manthang. Lo-Manthang is the walled city which once used to be the capital of Upper Mustang. Continue your walk through the dusty road to finally reach Lo-Manthang. Lo-Manthang is an ancient walled-town that surprises travelers with its uniqueness. overnight at tent camp. The walled city of Upper Mustang - Lo-Manthang has its own significance. Located on an isolated and rugged plateau, the settlement hides behind the massive Himalayan range. It is one of the most remote and unexplored parts of Nepal that has been successfully preserving its unique culture and tradition. It was forbidden for trekkers to enter until 1992. Although thousands of travelers visit Lower Mustang these days, only a handful of them arrives this isolated region of Upper Mustang. The city looks like the one of Middle Ages. The mud and stone houses are whitewashed, and there are a couple of centuries-old monasteries and prayer walls, There are so many things to explore in Lo-Manthang that travelers usually decide to stay more than one day in Lo-Manthang. overnight at Tent camp. After your morning breakfast, you will leave the place and gently climb until you reach De-La. Walk through the dusty trail and get the last view of Lo-Manthang. And then continue your journey and walk through an uphill trail to reach a ridge from where you get a scenic view of the surrounding area. Then, continue your walk to a pass and begin descending down through a steep and dusty trail to arrive at a wide plateau. Continue your descent for a while to make it Dhi village. After your lunch, cross the Kali Gandaki river by a suspension bridge and climb for a while. Then, walk alongside the river to finally arrive at Yara village. Overnight stay in a tent camp. Today, ascend to Luri Cave monastery and visit the monastery. After visiting the monastery, cross a 5100-meter pass and walk on a barren valley for hours to get to Ghuma Thanti.overnight at Tent camp. After your morning breakfast, continue your trek encountering some up and downhill climbs on the way. You will cross 5600-meter pass today. You will have a long and tiring walk to finally reach Damodar Kunda. Stay overnight in a tented camp near Damodar Kunda. Spend your day exploring Damodar Kunda and the surrounding. Hike to nearby small hills and capture some breathtaking photos. Damodar mountain lies to the north whereas the Annapurna massif proudly stands to the north. At 4890 meters of altitude, the place is too windy and cold. There are three ponds. Although people normally call all the three ponds Damodar Kunda, the individual name of the ponds are Kamandalu Kunda, Dudh Kunda, and Rakta Kunda. Every year on the full moon of August, many Hindu and Buddhist pilgrims go to Damodar Kunda. Stay overnight in a tented camp near Damodar Kunda. Retrace back to Ghuma Thanti through the same route that you had taken two days ago. Overnight in a tented camp in Ghuma Thanti. Today, you will return through the same route that you used a few days ago. After following the same route for a while, you will deviate from that route and ascend to a hill. Then, you will descend until you reach Yara village. overnight at Tent camp. Today, you have a long walk do. Start early in the morning with a short uphill climb before walking on a long and flat trail. Then, you will climb down through a narrow and steep trail to Dechhyang river. This river originates from Damodar Kunda. Then, you will have a steep uphill climb to do to reach the top of a pass. After having your lunch, you still have a to up and downhill climbs to do before you reach on a plateau. You will then walk on the plateau for a while to finally arrive at Tangye village. overnight at tent camp. Today is a long and tiring day. So, you will have to start early. After leaving the village, you will cross a suspension bridge and walk alongside the river for a short time. Then you will have to ascend for a while to reach a small pass. You will then head towards Paha- small house. You will have your lunch there and continue your journey and cross several small passes and reach the top of a hill. Then, you will walk down through a steep trail for a long time to finally arrive at Tetang village. The breathtaking views of Dhaulagiri, Nilgiri, Tukuche, and other mountains accompany you throughout the walk. Overnight stay in a tented camp in Tetang. After your morning breakfast, you will begin your walk. Pass the mani walls and ascend to a wide valley. Keep on ascending until you will reach a small pass. From the pass, you will have magnificent views of the mountains of the Himalayas and the surrounding landscapes. From the pass, you will start descending towards a small stream and cross it. Walking for a while, you will arrive at Chhyongar village. Continue your walk for a while through a plain trail until you reach Muktinath. Explore the holy temple of Muktinath and the surrounding. Muktinath is a holy place of both Hindus and Buddhists. There are 108 water spouts where pilgrims take baths. Near Muktinath temple lies a monastery. After visiting the temple and the monastery, you will head towards the campsite. Leave Muktinath after your breakfast. Then descend down to Jharkot village where you can visit Sakyamuni monastery. Then, walk through the road and take a shortcut to reach Ekle Bhatti. Have your lunch there. After lunch, you will walk through a road alongside the Kali Gandaki river to finally arrive at Jomsom. Overnight stay in a hotel in Jomsom. Early in the morning, take a flight to Pokhara. After leaving your backpack in your hotel room, you can spend the rest of the day sightseeing Pokhara or engaging in adventurous sports. overnight at hotel. Travel to Kathmandu by Domestic flight. After arriving at Kathmandu, we will transfer you to your hotel room. Spend the rest of the time relaxing in your hotel room or visiting Thamel. Thamel is a touristic center of Kathmandu. You can buy souvenirs, visit markets, pubs, and restaurants in Thamel. We will host you a farewell dinner in the evening in a typical Nepali restaurant. overnight at hotel. Today, we will transfer you to the airport terminal and wish you a safe and happy journey. We hope to work with you again.